If you arrived here from the main HMFMC Blog-Hop post then you are in the right place. If you didnt. please go back HERE to check out Hop details and get inspiration from our fabulously talented Mousey Design Team's Designs. One very Lucky winner will get a $25 Gift Certificate to shop at the official HMD store! This next Candy is from the House-Mouse TEAM!! These could be yours for the taking, so be sure to hop & play! From here, hop over to my awesome Teamie, Christine Craig's blog, HERE. In case you get lost along the way, below is the complete list of the Designers BLOGS to visit along this HOP....You will find tons of wonderful inspiration along the way! Make sure to visit ALL of these Designers' Blogs because they have created some amazing projects they want to share! They have hidden CANDY too! Be sure to leave us some love and continue hopping down the list until you get back to the main Mousey Blog. You'll want to leave a comment there as well. Finally, you MUST create something Spooky, or Sweet, or Colourful and enter it into this challenge for you chance at winning the oh-so yummy Candies and great prizes! Please contact me within 48 hours to claim your packages!! Papertake Weekly - fright night! Happy Hopping and Happy Halloween! Hi America, I don't know about spooky but this one sure as heck is sweet and adorable. Such a great scene and I love the ribbon and your green panel. Nice idea to have a shaped card also. Hi America, your shaped card are super cute and the colours beautiful...I've never seen this image before, so sweet. WOWZERS, you certainly went with colorful....love it! That scene with the mice and pumpkins is wonderful and so beautifully colored girlfriend!! The green mirror paper looks so cool with the embossing too. Sparkly ribbon is perfect. Love your bright fun card! I love your spooky colourful card! Gorgeous die cut shape, perfect choice of embellishments and super cute image. Love the bright bold colouring. Great card! I love Halloween and the colors and images! Wishing you a happy day! 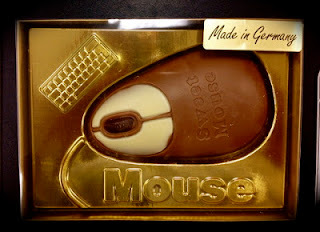 what a great and yummie giveaway. And thankssssssssssssss for the gorgeous prize I have won. So sparkly and festive. I like the shiney paper and your ribbon is cool. Festive card America. Just fantabulous!!! Your design and colours are stunning and I adore that beautifully coloured image and I love your awesome embellies. Your image is adorable and I just love all the bright colors! The added sparkle & ribbon look wonderful! Ahhhh, your cards are so bright & colorful! Thanks for the Halloween goodies! Without saying-this is Spooktacular Mzzzz America! (down to the spooky night lighting too) These are such great colors! This is a "spooktacular" card America! Love the color combo that they have picked for this challenge! Congrats to your candy winners....:( sorry I wasn't one....maybe this time I'll get lucky! I absolutely love House Mouse designs and your card is fabulous! Love the coloring technique and the 3-D effect with that die cut fence! I am a new follower and already follow the House Mouse and Friends blog! Oh I love your stunning cute card. Adorable Halloween card! Fabulous coloring and I love that sparkly ribbon!! Thanks for joining us at Crafty Calender this month! Very cute card. Thanks for playing at TG. This is gorgeous!! The image is so cute and I love the ribbon you used. 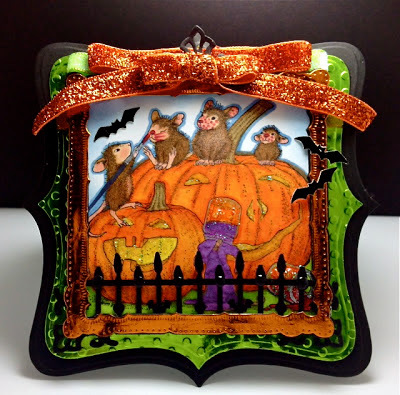 Wowzer cute spooky mousey creation..so much detail I keep finding more to look at..great shape love the shinny frames, thanks for all your hard work on the blog hop GF..
Fabulous spooky and colourful creation. What a brilliant image, I love it. Gorgeous ribbon too. Wow super cute Halloween card! those wee mice are definately to cute to spook!! Thank you so much for joining the fun this time over at basic grey challenges! This is FABULOUS well done and its super spooky mice style . OMG this is just the cutest thing! I love the mice and mouse house stamps. Thanks for joining us at Dilly Beans this week! fabulous card!!! your colouring is just stunning love the little house mouse!!! Hello my friend!! :) You know that I just ADORE this lady!! Your bright and colorful Halloween design is fantastic!! I haven't made my way around the entire blog hop yet and I'm itching to get out my Halloween critters out for a play!! LOL!! So of course I'll be joining along with you all!! Just a darling card. Thanks for joining us at Color Me Creative challenge. I love seeing your creation. Good luck on the challenge. What a sweet image and such a superb combination of colors! It's a great shaped card, and the die cut elements blend in so well! I came over from MIM to visit. just funny pics! i love your card! THESE would be welcome in my home anytime! Your HM Halloween card is adorable. Your coloring has really brought the scene to life and I loooove that gate! Thank you so much for joining our challenge and sharing your wonderful talent and creativity with us at Heck of a challenge. Love the layers, especially the shiny orange and green frames. Your coloring is wonderful and the orange ribbon is a great topper. Gorgeous shape Halloween card. Beautiful details and colouring amazing. 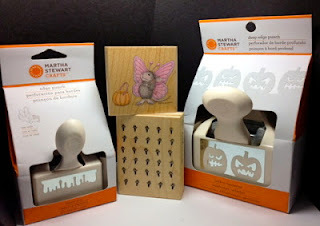 Thank you for joining us at Sweet Stampin` “Halloween” Challenge and we hope to see you again soon. This image is just the sweetest! I love how they are getting their little faces painted! Fantastic project, America. Oh my, this is such an adorable image - nice, bright coloring and just CUTE. Its so gorgeous, what a lovely image coloured so beautifully! Lovely card with lots of very nice details. Soo cute! Love that sparkly orange ribbon! A beautiful card America, i love the brightness of the colours, and the details, such a cute image. Hi America, fantastic halloween card. The stamp is gorgeous and coloured beautifully, like others before me l love the green shink paper too. Well done to the candy winners. What a fabulous card! It is so cute and wonderfully done! I love the shiny green border! Hey Mouse Mom...is your family okay in this storm? Wow, great colouring, such bright colours. awwwwh how cute they are! I love that stamp (though i am never happy with my colouring of it...) - you however did it wonderfully! Awesome card, but all your cards are fabulous. An excellent card! The form is excellent, the colouring is excellent and the design is excellent. I love this stamp! The pumpkins are splendid. The idea of putting the motive into the frame is fabulous. Unfortunately, Halloween is not so popular in Germany.